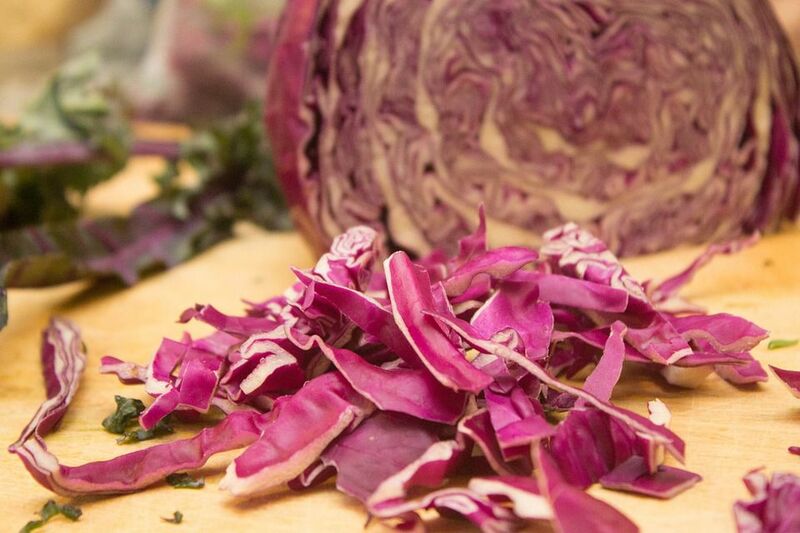 Red cabbage makes a colorful variation of traditional sauerkraut. Try serving it with crisp, chopped apples for a quick, delicious salad. Lacto-fermented foods like this recipe are easier to digest than raw vegetables, and their nutrients are more easily assimilated by our bodies. Plus they are loaded with probiotics that are good for our digestive systems and overall health. Making sauerkraut couldn't be easier – no canning, no sterilizing jars, no long list of ingredients. You can have all the work done in under 10 minutes. The only difficult part is waiting a week while the sauerkraut ferments and the flavor develops. Cut the cabbage in half. Cut out the thick core and stem end and compost or discard them. Thinly slice the cabbage into shreds or small pieces (think coleslaw). Loosely pack the sliced cabbage into clean glass jars, sprinkling in some of the caraway seeds and juniper berries as you fill the jars. Make a brine by dissolving the salt in the water. Pour the salt brine over the cabbage and spices. Gently press down on the cabbage and spices to release any air bubbles and to submerge them in the brine. Cover the jar loosely with a lid. Place the jar on a plate to catch any overflow that may happen once active fermentation gets going. Leave the jars at room temperature for 3 days. During this time, remove the covers at least once a day and check to see that the vegetables are still submerged in the brine (add additional salt brine if necessary). You should start to see some bubbles on top, which is a sign that fermentation is underway. By the end of the 3 days, the red cabbage sauerkraut should have a clean, lightly sour smell and taste. Put the jars in the refrigerator (no need to put plates under them at this stage). Wait at least 5 more days for the flavor of your red cabbage sauerkraut to develop. This recipe also works well with white cabbage. Sauerkraut will keep in the refrigerator for at least 6 months but is best eaten within 3 months. After 3 months it tends to lose some of its crispness.